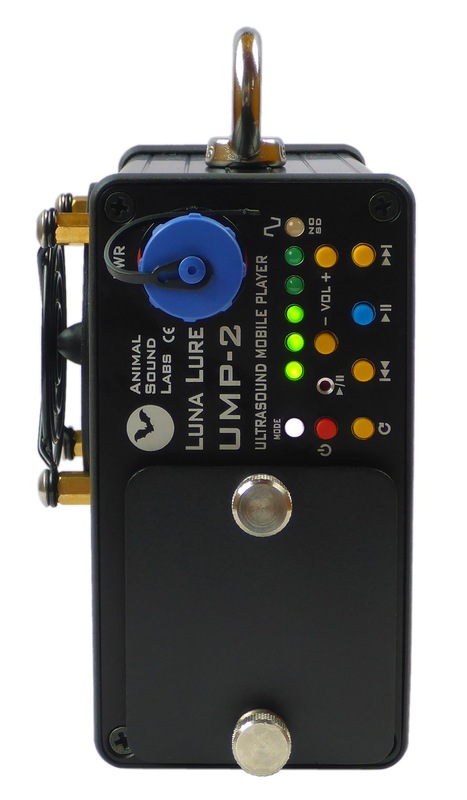 Luna Lure UMP-2 is an improved and enhanced design of our first Luna Lure UMP-1 ultrasonic player. It is a complete device for broadband playback or luring bats or other animals thanks to a wide spectrum of reproduced frequencies. Works on the reproduction of audible or ultrasonic sounds from recordings in the form of WAV, MP3, FLAC or APE files, mono or stereo (single or dual channel) recorded on SD / SDHC / SDXC memory cards. 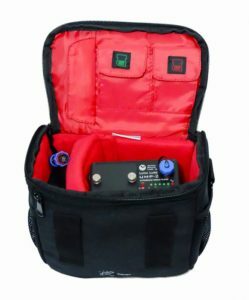 Built-in power supply (8 AA / R6 cells – primary or rechargeable batteries) and allows up to several hours of field operation. External power can be also connected if needed. 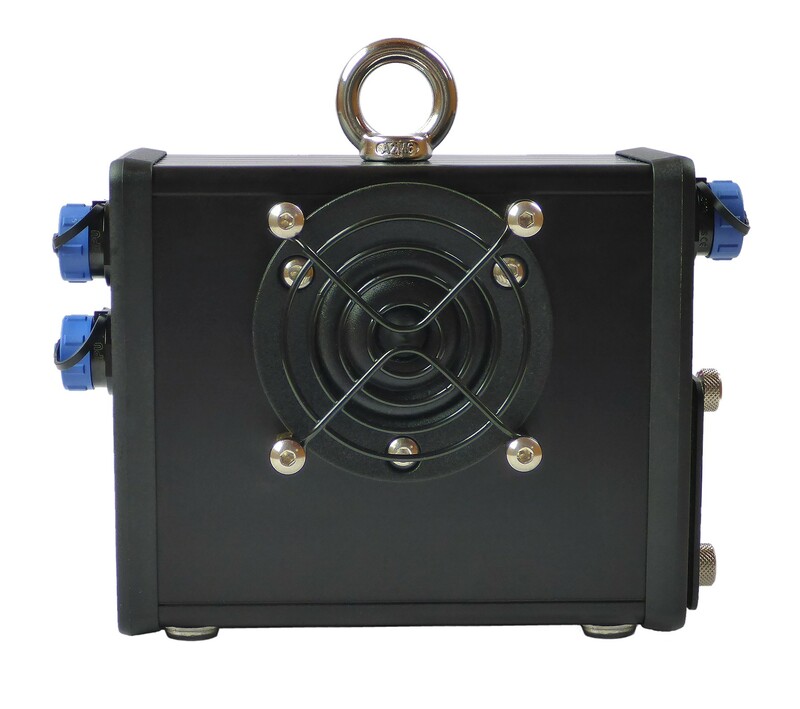 The uniqueness of this design over the competition lies in its reduced weight and external dimensions while having higher output power at the same time and a higher ultrasonic propagation angle (no speaker collar/flange, better speaker protection against animals in the form of an acoustically transparent metal mesh) and the ability to connect an external signal source via the LINE- IN connector (the device works also as an ultrasonic active speaker). Greater output power of the internal amplifier is used for boosting the propagation distance and for compensation of frequency response of the transducer, so that the reproduced band is also wider, which allows the reproduction of echolocation eg small horseshoes (Rhinolophus hipposideros) and all other bats. It is also possible to play the social voices of bats and even the singing of most birds by the relatively low frequency limit from about 1 kHz. In addition Luna Lure UMP-2 can be connected to active ultrasonic speakers Luna Speaker UMS-1 with its own independent internal amplifer and power supply via LINE-OUT connector and low-loss signal cable, for example to further expand the beam width (eg, to direct the ultrasound in opposite directions on both sides of the net) or increase the radiated power in a given direction. 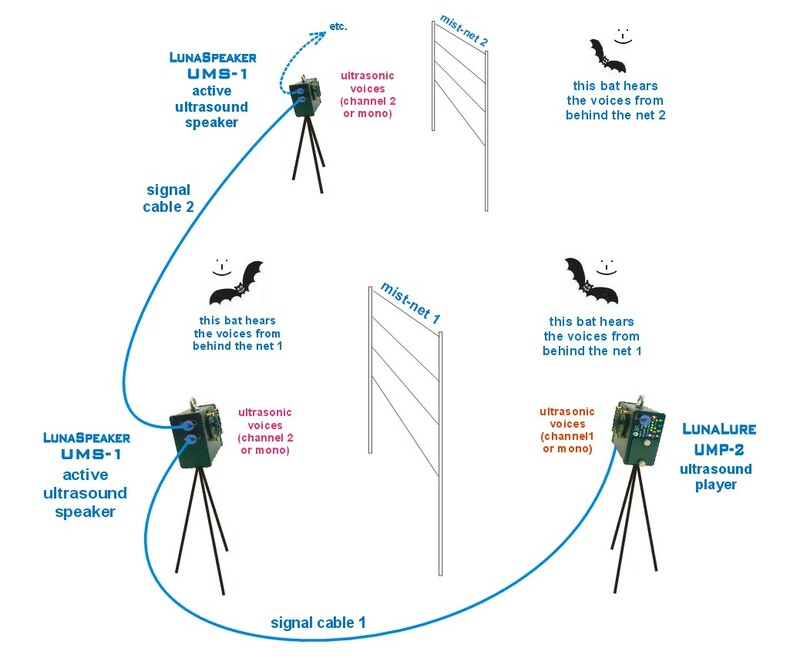 By using two channel processing of the recordings from the memory card when connecting an additional external speaker Luna Speaker UMS-1 or another Luna Lure device – two independent sources of sound or ultrasound can be obtained. Ultrasonic reproduction from audio recorders or bat detectors and even the recordings from time-expansion detectors is also possible – files for playback need to be converted to a suitable sampling rate in any audio editor, such as Audacity. Additionally, the control panel has added buttons to switch files (PREVIOUS “<<” / NEXT “>>“) But START “>” / PAUSE “||” switch also allows you to switch to USB-DAC mode or to work as an active speaker. A separate button is used to switch to loopback on a single current file mode (by default, looping of all files on the memory card is enabled). 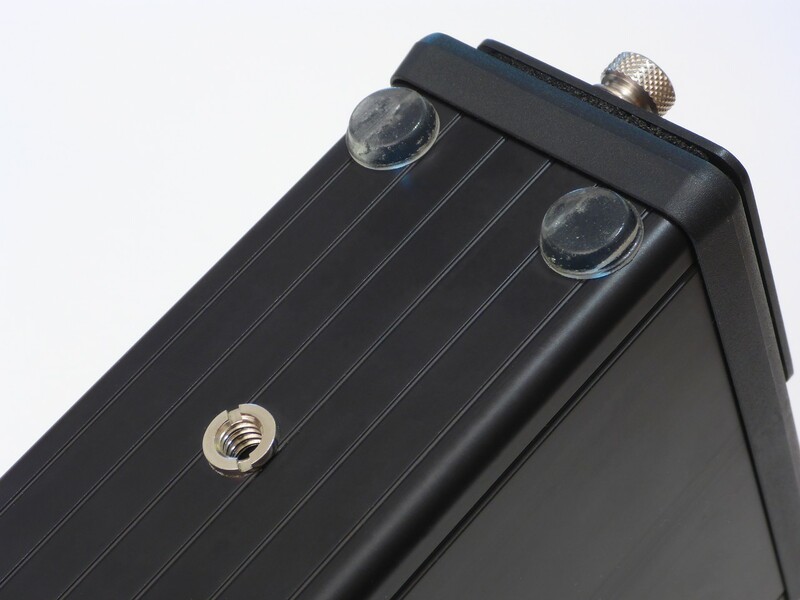 Another unique feature is displaying the level of supply voltage on LEDBAR in 3 seconds after powering the device, so the user can quickly determine whether batteries or accumulators have enough energy to work with the device. There is also a USB-DAC interface built into the device, which can now play non-distorted sampled signals only up to 96kHz of sampling rate. The interface also allows transferring data to a memory card (the memory card slot is visible as an SD card reader). This interface, however, is intended for future broadband ultrasonic reproduction directly from the computer (it works as a one-way 2-channel DAQ card). Up to 96kHz sampling is possible on the software side, although the interface can run up to 384kHz on the hardware side. However, software drivers need to be fine tuned to reproduce the signal correctly at 176.4kHz, 192kHz, 352.8kHz and 384kHz. To switch the operation mode, press the PLAY / PAUSE button twice. When turned on again, the device reports as a mobile player. For ultrasound playback at frequencies higher than 48kHz directly from the computer with the device, you can now use a separate USB interface LunaDAC-1 available in our offer and LunaLure UMP-2 can be used as an active ultrasonic speaker. During recent tests the internal USB-DAC interface can properly work with all sampling frequencies (44.1k, 48k, 88.2k, 96k, 176.4k, 192k, 352.8 and 384kHz) when connected to Apple/Mac laptop or tablet with newer OSX systems without the need to install any additional drivers (Apple OSX has its own built drivers and has native support for USB Audio Class 2.0 devices like internal interface in Luna Lure UMP-2). ** – via ASIO driver (can be used with popular Foobar player via foo-ASIO-out plugin). Driver for Windows XP/Vista/7/8/10 is provided on a memory card or in Download section. There is also the possibility to play from a PC via a WDM driver as a regular USB Audio Device – the playback is then limited to a maximum sampling rate of 96 kHz. Future development of drivers will unlock all higher sampling rates. The Luna Lure UMP-2 device itself is sufficient for point-and-click lure from one direction. 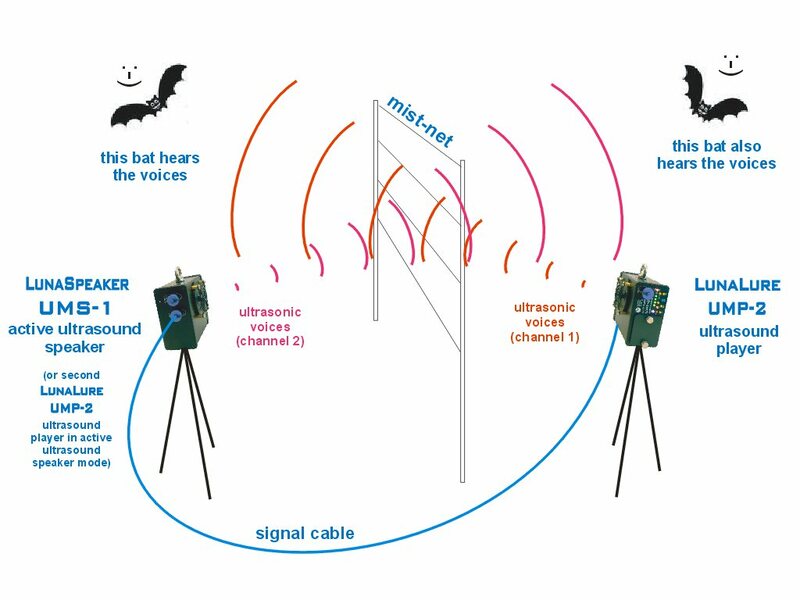 The bat (on the other side of the mist-net and in the axis of the speaker’s radiation of the ultrasound player) hears the familiar voices and curious / lured tho them it flies closer to the signal source, but on the way falls into the mist-net. Because of the direction of ultrasound radiation from the loudspeaker – their intensity rapidly decreases beyond the axis of the speaker’s radiation. In addition, the intensity decreases the faster, the greater is the frequency of the transmitted signal. 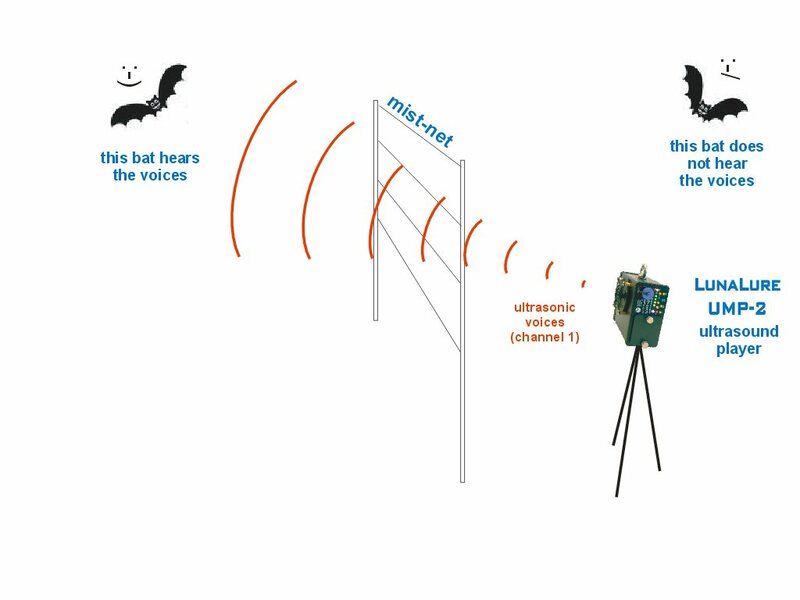 As a result, a bat outside of the speaker’s axis (or even behind the speaker, on the same side of the net) will not hear the reproduced ultrasound and will not be lured / caught in the net. The implications of using such a solution are many. For example, you can drive off two (or more) remote locations using only one Luna Lure UMP-2 player and one (or more) Luna Speaker UMS-1 connected to it. At the same time, the connection of the active speakers is cascaded – the first connected active speaker is connected to the second active speaker, etc. The total cost of such a solution is considerably lower than that of using separate playback devices for individual locations. And because of the much lower price of active speaker (even with long signal cable) than the separate player this is the more cost effective solution as there are more points in the area where the catches are to be carried out. In the above example, the “mixed” configuration is also possible, ie the LunaLure UMP-2 player reproduces channel 1 / right and the Luna Speaker UMS-1 active speakers reproduces channel 2 / left. SD / SDHC memory card with example .WAV file set to attract a few species of bats and drivers & software required to play sounds or ultrasounds from a computer. 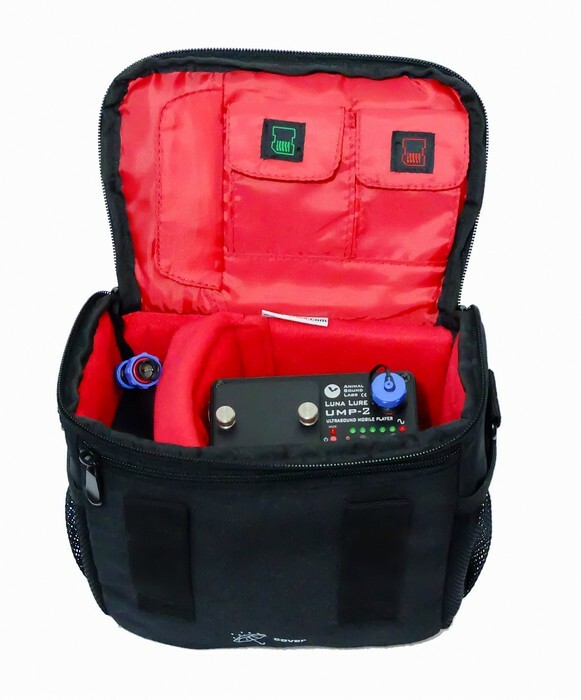 The price includes free shipping in Europe and borrowing equipment free of charge for defect products within 3 years after purchase.